Today's card is another oldie but goodie from last year. I've been preparing for today's technique class & finishing up some other projects I've been working on.....no time for pictures but I hope to have something brand new to show you very soon! Thanks for hangin' out with me! I really appreciate you stopping by and have a great rest of the day!! Very pretty, Jackie! Love the soft colors! Now this is very pretty. I like how the background makes the flower look like it's bursting with color! Just fabulous! Would be a sweet Easter card. Love the background! Your card is sensational! Wow! The colors are gorgeous! Love the soft colors! The white really makes it pop. So cute! I love the look of the backgound paper. This is lovely. I just love that yellow and that flower is great. That background paper is gorgeous is it pp or your own creation? I love the sweet pastel colors, so perfect for spring!! 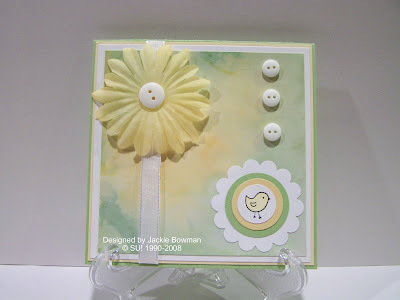 Great card, love the soft colours you used. An oldie for you, but new for me to see!! This made me think of a summer day and a shaved ice creation! I've never tried this technique. Yours turneed out very soft and subtle. Pretty. OH MY ..this card is beautiful...I love this so much and amazing such a simple image into such an amazing card! This is a beautiful card! The colors are soft and soothing. Thanks for sharing! This is so fresh and clean. Wonderful look for Spring. Love the colors and your background paper is the perfect choice. Jackie, may I add you to my blog list? Super lovely - I like the color combo!